Washington – President Donald Trump on Monday repeated his threat to bus migrants to “sanctuary cities” like Hartford and New Haven as congressional Democrats launched yet another investigation into his administration – asking for all documents related to discussions of the controversial proposal. Judiciary Committee Chairman Jerrold Nadler, D -N.Y., Government Oversight Committee Chairman Elijah Cummings and Homeland Security Committee Chairman Bennie Thompson, D-Miss., on Monday gave the administration a deadline of May 3 to turn over information. The lawmakers are seeking emails and other documents related to discussion of the plan to send migrants who have been detained at the border – most of them seeking asylum – to jurisdictions that Trump says don’t fully cooperate with federal immigration policy. 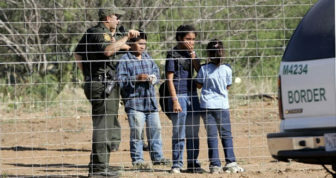 Those Connecticut cities fall under that definition because they don’t honor “detainers” or federal requests that local authorities hold incarcerated migrants for up to 48 hours after their scheduled release so they could be picked up by Immigration and Customs Enforcement (ICE) agents, or share certain information about detainees with federal authorities. Hartford Mayor Luke Bronin and New Haven Mayor Toni Harp have joined other leaders of “sanctuary cities” in a defiant response to the president’s plan. “Donald Trump labels all immigrants criminals, but we aren’t afraid of families seeking asylum and a better life, and if it would keep kids out of cages, we would do everything we could to help — just as we’ve welcomed thousands of refugees and asylum seekers decade after decade,” Bronin said. “Given the continuing dearth of a lucid federal immigration policy, and for as long as I’m mayor, New Haven will continue its open-arms tradition for those fleeing oppression in other countries and for those who seek a better life here,” she said. While the White House initially tried to downplay the proposal, first reported by the Washington Post last week, on Monday Trump said he’s prepared to distribute migrants in the nation’s detention facilities that are filled to capacity to immigrant-friendly cities run mostly by Democrats. “Those Illegal Immigrants who can no longer be legally held (Congress must fix the laws and loopholes) will be, subject to Homeland Security, given to Sanctuary Cities and States!” Trump tweeted. Congress is on a two-week break for Easter and Passover. Some immigration experts predict the administration would have difficulty defending in court a policy of sending immigrants to sanctuary cities and say it would be difficult, and expensive, to put into practice. U.S. Customs and Border Patrol says the number of migrants fleeing violence and poverty and apprehended at the U.S.-Mexico border increased by 300 percent this fiscal year, challenging an already strained immigration system. ICE’s capacity to hold immigrants is limited — it has enough beds for about 50,000 people. Most immigrants seeking asylum have no criminal record, according to Syracuse University’s TRAC database. But there are few alternatives to detention under the Trump administration’s “zero tolerance” policy, which does not allow migrants to be freed on parole pending their immigration hearings. Ana Radelat Ana is a longtime Washington correspondent who has won numerous awards, including from The Associated Press and Gannett, has written for more than a dozen newspapers, including USAToday; The (Jackson, Miss.) Clarion-Ledger; the Shreveport (La.) Times; and the Montgomery (Ala.) Advertiser. She’s also been a regular contributor to other publications, including the Miami Herald and Advertising Age. Some of the stories Ana has broken focused on the strategies of disgraced lobbyist Jack Abramoff, former Sen. Trent Lott’s fall from power and questionable Hurricane Katrina contracts. A regular contributor to WNPR, Connecticut Public Radio, a partner of The Mirror, Ana is a graduate of the University of Maryland School of Journalism. Despite long odds Medicare-for-All will ever become law, investors are nervous. Tammy Exum, a Democratic former member of the Board of Education in West Hartford, won a special election Tuesday in the 19th House District of West Hartford, Farmington and Avon, according to the House majority office. His press office billed the event as a roundtable review of the Lamont administration’s accomplishments in its first 100 days. The table wasn't round, the review perfunctory.